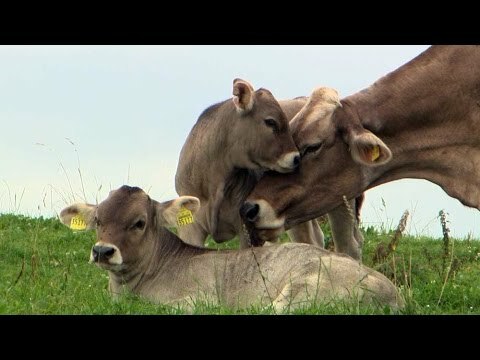 Three dairy farmers have been rethinking their way of farming and now oppose what they had been taught so far. Their cows should be kept species-appropriate and should above all live a "horned" life. Not only the cows benefit from such a change, but also the farmers feel better with their rediscovered closeness to nature. "I want to be a farmer again, previously I was a destroyer", Franz-Josef Kögel says while petting his cows. "Before I changed the way of farming, I used to demand high performances of my cows and locked them up in the cowshed all year round. I stuffed them with feed pellets and drugs, and dehorned them - until they got sick." Franz-Josef Kögel completely changed everything - himself and his cattle: daily grazing, only grass and hay, and no more dehorning. It is true that they now give less milk but they are healthy and live longer. More and more farmers in the Allgäu region think and act this way and turn their backs on high performance dairy farming. The families Schwärzler and Josef Notz are as well fighting against the cruel dehorning. Conditions of keeping and living should be adapted to the animals and not vice versa. Even vets, such as veterinarian Dr. Rupert Ebner from Neuburg, refuse to dehorn the cattle just to jam more animals into one cowshed. Great views - hopefully not only for the Allgäu region, where again you can see cattle with horns on the pastures.